SUCCEEDED YOUR EXAMS? SAY IT YOUR WAY. WITH GREETZ. How do you congratulate someone who has passed his school exam? With a greeting card or gift from Greetz of course! And how do you surprise their parents, friends, family and grandparents? By targeting this group at the ‘moment suprème’ with a very striking mobile take-over, which is responding to that well-known, exciting phone call that is still in everyone’s memory. The take-over was adapted to each smartphone brand, so everyone received their own familiar incoming call-screen. So, it was as if your phone really rang, with ‘school’ on the caller-ID…! 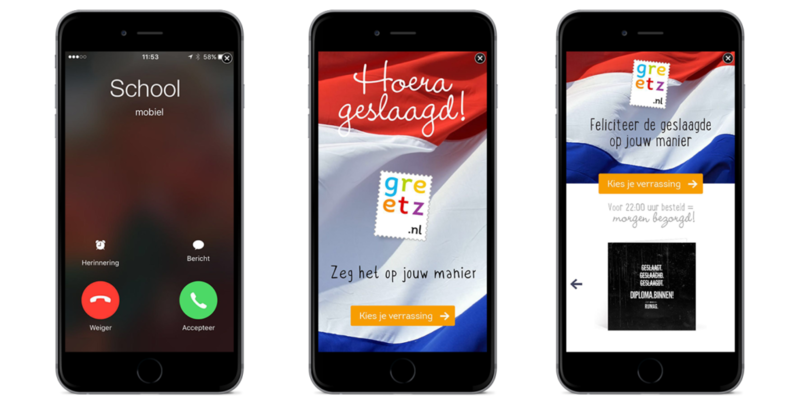 It soon turned out that this ‘incoming call’ was a message from Greetz. With -of course– some nice gifts to surprise the student. Say it your way. Greetz.